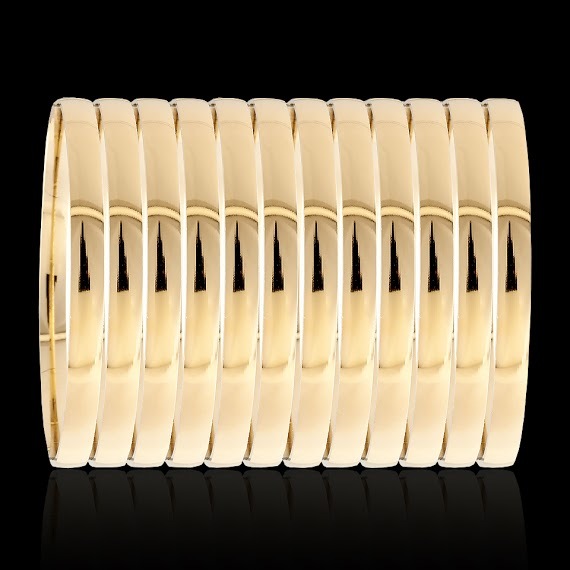 Description Sparkling & smooth micron finish Gold plated plain style bangle bracelets. These bangles are flattish on the inside and not curved. They have smooth edges for a comfortable sliding fit that won't hurt! This bangle feels slightly heavier than our usual diamond-cut bangle, which gives it a solid gold look and feel. Styles This is a plain style bangle, with no diamond-cut designs. Size Range This bangle comes only in Size 5 or Size 6 at this time, which are the teen and regular adult sizes that fits an average adult. Please check the bangles size chart for the right size you need.